A list of temples destroyed in the Kashmir Valley between 1986-1996. 1. Ganpatyar temple, Srinagar Stoning and Arson..
2. Bhairav temple, Maisuma Stoning and Arson. 3. Temple in front of Gurudwara at Amiradadal ransacked. 4. Shiv temple, Jawaharnagar stoning and arson . 5. Bhairav Mandir, Karan Nagar ransacked and Carpet burnt. 6. Shiv temple near secretariat stoning and arson . to firing to disperse the muslims. 8. Narayan Math Mandir in Tulsi Bagh arson and stoning. 10. Shivalay Mandir, Nai Basti – heavy stoning, ransacked. 11. Temple at Wanpoh on Khanabal-Qazigund Road – set on fire – heavy damage. 12. Another temple at Vanpoh – set on fire – heavy damage. 13. Temple at Aishmuqam – Idol damaged and temple ransacked. 14. Temple at Dhanbogund, Kulgam – set on fire – heavy damage. 15. Navgam temple, Shangas – Heavy stoning – heavy damage. 16. Achhabal temple near Navgam – Heavy stoning – heavy damage . 17. Temple in Lokbhavan village of Thana Qazigund –ransacked. 18. Second temple in Lokbhavan village of Thana Qazigund –ransacked. 19. Third temple in Lokbhavan village of Thana Qazigund –ransacked. 20. Forth temple in Lokbhavan village of Thana Qazigund –ransacked. 21. Harish Chandra Seva Mandir, Beejbehara – idols destroyed ransacked the temple. 22. Devi Mandir, village Karebal Beejbehara –Idols damaged and temple ransacked. 23. Shivalay Mandir, Janglat Mandi, Anantnag town –ransacked and heavy damage. 24. Temple of Dyalgam – ransacked and heavy damage. on fire – heavy damage. 27. Shiv Mandir at village Koil, Thana Pulwama – arson and looting. 28. Temple at village Trisal, Thana Pulwama –destroyed Idols, stole microphone. Boundary wall broken. 29. Kali Mandir in Jamla Kadal Mohalla, Sopore –arson. 30. Fatapura temple, Sopore – stoning. 31.Chandi Puiarl temple, Vyosu Thana Qazigund) – Arson and looting. 32. Sharda Devi temple, Yalkot (Thana Badgam) – arson and one part of the temple burned. 33.Shiv Temple, Sanghampura – (Thana Biru) – building damaged. 1. Ram Mandir, Maharajganj, Shrinagar – arson and looting. 2. Shiv Mandir, Sarafkadal, Shrinagar – stoning and arson. 3. Shiv Mandir, Bandipur – arson and looting – Heavy damage. 4. Shri Raghunath Mandir, Barmulla – Bomb explosion in Mandir. 5. Shiv temple, Shopian – Temple burned down and fully destroyed; heavy damage. 6 . Local tempIe in Tral – Arson and looting – Heavy damage. 7. Devi Mandir, Anantnag – arson and looting. 8. Basaknag mandir, Bhadrawah – arson and looting. 1. Shri Ram mandir’s Hall, Barbarshah Shrinagar – Bomb explosion. 2. Shiv Mandir Chota Bazar, Shrinagar, Mandir burned looted and fully damaged. 3. Shri Raghunath Mandir, Shrinagar – arson and looting. 5. Suchcha Nath Mandir, Shopian – arson looting and burning– heavy damage. 6. Shri Ram Mandir, Badgam – destroyed; idols looted – heavy damage. 8. Supernag Temple – Idols looted and temple burnt. 9. Siv Mandir Kiratwar – explosion on 2nd Nov. – minor damage. 10. Buichhal Mandir – explosion on 10th Nov. – heavy damage. 11. Temple in Kulharad village – arson burning and looting, heavy damage. 12 Temple in Bharat village – arson and looting – heavy damage. 1. Arya Samaj Mandir and School, Shrinagar – Bomb explosion on 10th Feb.
2. Shri Raghunath Mandir, Shrinagar – arson and looting. 5. Shitalnath Mandir, Shrinagar – arson and looting on 18th Nov. heavy damage. 6. Lakshmi Mandir, Bijbehara – arson and looting on 4th August – Heavy damage. 7. Sharda Mandir, Kalusa, 8andipur-arson and looting. Heavy damage. 8. Handura Mandir – Idols destroyed and many Idols were taken away. Temple Precincts desecrated. Heavy loss and destruction. 1. Nagbal Mandir, Anantnag – Bomb Explosion . 5. Shri Raghunath Mandir, Shrinagar –arson and looting. 1. Raghunath Mandir, Karafali Mohalla, Shrinagar – Stoning , Arson and looting. 2. Temple in Anantnag – Stoning , Arson and looting. 3. Temple in Shrinagar – Arson and looting. 4. Temple in Kulgam, Anantnag – Stoning , Arson and looting. 5. Shiv Mandir, Sherpore Kund – Stoning , Arson and looting. 6. Temple at Karichhama – Tang Marg, Baramulla – Stoning , Arson and looting. 7. Temple in Baramulla on Kungar Tang Road – Stoning , Arson and looting. 8. Shri Vishnu Temple, on the Bank of River Jhelum Stoning , Arson and looting. 9. Kuvi Utraso Temple Anantnag – Stoning , Arson and looting. 10. Temple of Chitergund, Anantnag – Stoning , Arson and looting. 11. Temple of Bana Mohalla, Shrinagar – Stoning , Arson and looting. 12. Karfali Mohalla, Shrinagar – Stoning , Arson and looting. 13. Samshan Bhoomi Temple, Karannagar, Srinagar – Stoning , Arson and looting. 14. Narsingh Bagh – Shadipur Temple, Ganderbal, Shrinagar – Stoning , Arson and looting. 15. 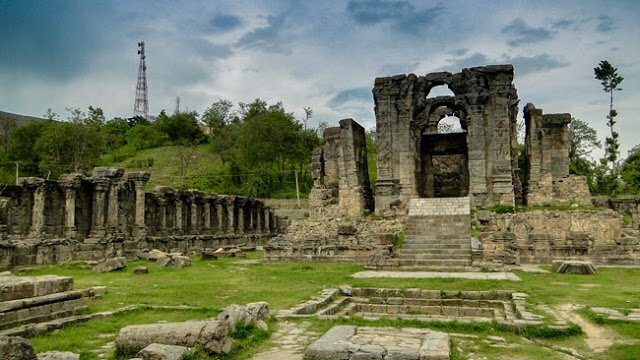 Nandkishore Temple, Sumbal, Baramulla – Stoning , Arson and looting. 16.Temple of Pahalgam, Anantnag. Stoning , Arson and looting. 17. Temple, Verinag, Anantnag. Stoning , Arson and looting. 18. Second Temple Verinag, Anantnag. Arson and looting. 19.Third Temple, Verinag, Anantnag. Stoning , Arson and looting. 20. Fourth Temple, Verinag, Anantnag. Arson and looting. 21. Fifth Temple, Verinag, Anantnag Arson and looting. 22. Sixth Temple, Verinag, Anantnag. Arson and looting. 23. Temple in Tragaon, Kupwara – Arson and looting. This entry was posted in History, Nation and tagged Hindu Temples in Kashmir on February 13, 2019 by arisebharat.